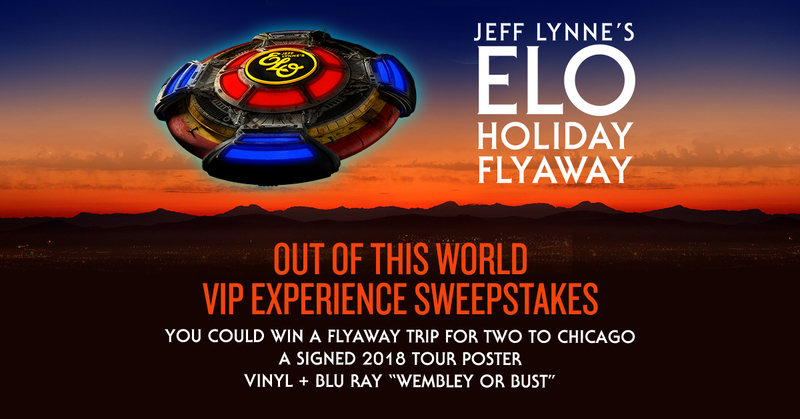 Enter now for your chance to win a VIP flyaway trip for two to see Jeff Lynne's ELO in Chicago, a signed 2018 tour poster, and vinyl + blu ray of “Wembley Or Bust"! Yes, I'd like to receive emails about upcoming events and special offers from the following. I understand I can unsubscribe at any time. Increase your chances of winning by sharing with your friends. You will receive one (1) additional entry for each successful promotion entry (up to a maximum of two (2) additional entries) from your personal referral link or share buttons below. Roundtrip airfare and hotel acommodations for winner and guest. Access to Jeff Lynne's ELO Exhibit featuring exclusive photography! NO PURCHASE NECESSARY. Open to legal residents of United States or Canada (except Quebec), 18 years or older. Void where prohibited. Ends 12PM PT 12/21/18. SPONSOR: Live Nation Worldwide, Inc.
Click below to see where Jeff Lynne's ELO will be touring!